We’d been meaning to go to Brighouse for a while as we know some people who live just outside of the town. It has to be said that Neil was excited to go because of the Brighouseand Rastrick Brass Band who reached number 2 with “The Floral Dance” in late 1977. As you’d expect their albums can be found cluttering up the vinyl section of many a charity shop in the area. The route to Brighouse is very straightforward from Manchester – M60, M62, exit junction 25, A644 and follow the signs to Brighouse. We parked for free in Tesco which is at the edge of the town centre. Although, note to self – must remember in future to turn off car lights, otherwise will end up needing to get new car battery. The weather wasn’t too great in Brighouse - it was a bit overcast and drizzly. However it was much better than Manchester which was experiencing a monsoon that day. Brighouse is typical of your Yorkshire town, sturdy and squat buildings made of local Yorkshire stone – understated but classy. 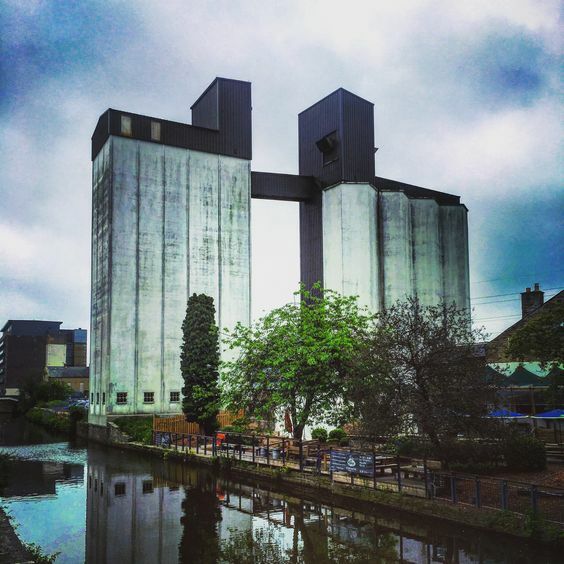 Although in Brighouse they have massive silos on the edge of town dominating the skyline. One of them has been turned into a climbing gym, which sounds like a good alternative to normal gyms which can be rather boring. A canal cuts through the town too - no doubt it used to service the huge silos back in the day. The town itself is a mix of traditional and independent shops. Clearly it has been inspired by the nearby Hebden Bridge and Holmfirth to up its game in terms of attracting out-of-towners into Brighouse with cafes and restaurants. But I do like to say it hasn’t gone overboard in that direction too so it retains much of its character. At the back of the main shops there is an open air market. It wasn’t that exciting as that Saturday it was a second hand market with locals flogging off stuff they didn’t need. It reminded me of the flea market in Huddersfield, which is on a much larger scale. The good thing I found about it was how friendly it was with stall holders and locals chatting. 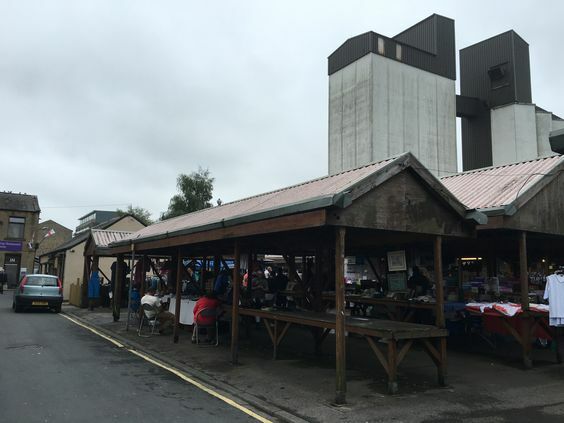 Apparently there is a Food and Craft market that pops up once in a while and dates can be found here http://brighousemarket.co.uk/. I did notice on Visit Brighouse website they do various festival weekends throughout the year and it’s worth timing your visit to coincide with these events. There are quite a few charity shops in Brighouse and naturally we toured them all. The charity shops were rather busy and Neil again was experiencing a severe case of charity shop blockers – basically old men slowly browsing through all the records Neil wanted to look at. If you are looking for wedding outfits or outfits for a fancy do, go no further than Overgate Hospice designer wear shop on Bethel Street. As usual in Yorkshire we had our chippy lunch and we went to Blakeley’s by the market. We both had fish and chips which were great. Somehow we missed the entrance to the restaurant and went to the takeaway bit. Thankfully they do have a sheltered outdoor eating place overlooking the canal which was a nice place to eat. There was a mum struggling to make her kids eat their lunch as they kept wanting more tomato sauce, even though they still had some on their plates. 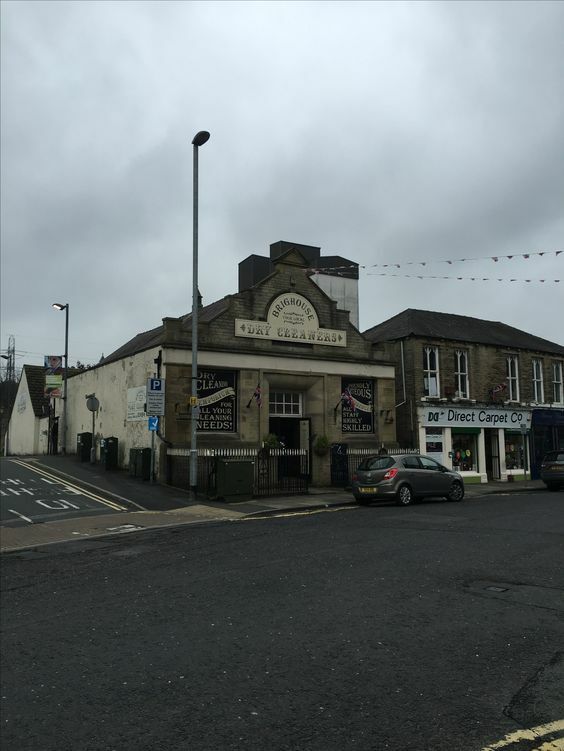 If you are looking for a place to drink in Brighouse you will be spoilt by the amount of pubs available here. 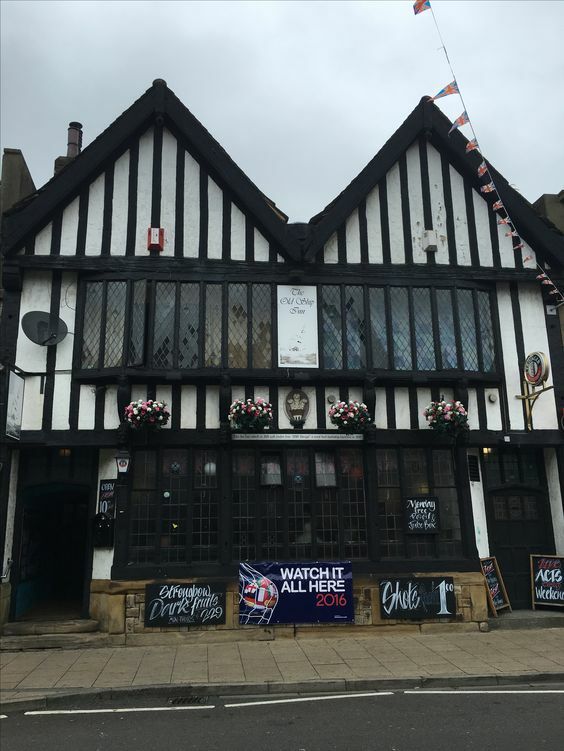 Many are the old traditional style pubs with lots of original features and I can imagine you’d be spoilt for choice doing a pub crawl here. I was very surprised to find the local Freemasons had put up a banner to recruit new members. I thought they were a rather secretive organisation, but clearly not in Brighouse. It was a pleasant trip to Brighouse, although the weather was a bit overcast. Brighouse is an interesting mix of the traditional and industrial, as the silos and industrial buildings do dominate the town. It doesn’t lend itself to being a traditional pretty Yorkshire town, but great for photographers who are looking for something different. Clearly the local town’s people are taking pride in the place and put on events throughout the year to attract people into Brighouse. We’d definitely visit again, but will time it with the Food and Craft Market as I do love exploring these type of events.